Meet “Corey,” a 16-year-old Midget-AAA hockey player from Ontario who dreams of one day playing in the National Hockey League. Like many in the minor ranks of Canada’s most beloved sport, Corey comes from a small town where hockey is everything. Residents bleed their team colours day in and day out, and local bladesters enjoy near-celebrity status. Yet while most players appreciate such support, Corey finds it superficial. His words are hardly surprising; homophobia in hockey is old news. But one detail in Corey’s thoughts—“gay like that”—suggests that the issue may have less to do with man-on-man action than one might think. To Corey’s teammates, ‘fag’ and ‘homo’ are synonymous with the effeminate male. And in their world, to be so is a shameful thing. As Eric Anderson, author of In the Game: Gay Athletes and the Cult of Masculinity, explains, “Athletes are socialized into a very narrow arena of masculinity. […] The punishment that is dealt out to those who do not follow the norm is so extreme that I have called it a cult of masculinity. In this light, perhaps it is inaccurate to maintain that the problem is homophobia per se. Wouldn’t it be more apt to diagnose hockey, and men’s sports in general, with a severe case of effemiphobia? Much of Corey’s frustration stems from the inability of many to draw a distinction between the two. Many people do not stereotype homosexuals as such, but Corey’s outlook is a product of his environment—one that replicates itself throughout small towns across the nation, where diversity wanes and simplistic views often flourish. But does this grim reality quash the dreams of young athletes like Corey, who ache to play the game without giving a single thought to their sexuality? Is it simply that NHL players, many of whom come from small towns, bring with them the intolerant attitudes experienced by our young subject? Patrick Burke, a scout for the Philadelphia Flyers and son of Toronto Maple Leafs’ president and GM Brian Burke, is no stranger to the difficulties gays face in professional hockey. Burke’s younger brother Brendan shocked the sports world when he came out of the closet in 2009. Though he himself was relatively unknown at the time, his father’s fame meant that he was the highest-profile name ever to come out in connection to the sport. Following Brendan’s untimely death in a car crash in 2010, the Burke family redoubled their efforts to promote equality and acceptance in sports. In an interview with CTV News, Patrick expressed his aim to rid hockey (and all sports, for that matter) of what he calls “casual homophobia.” And he appears to be making some headway. As one of the foremost families in professional hockey, the Burkes wield considerable power over the minds of those aspiring to the big leagues. But what do the pros themselves think? 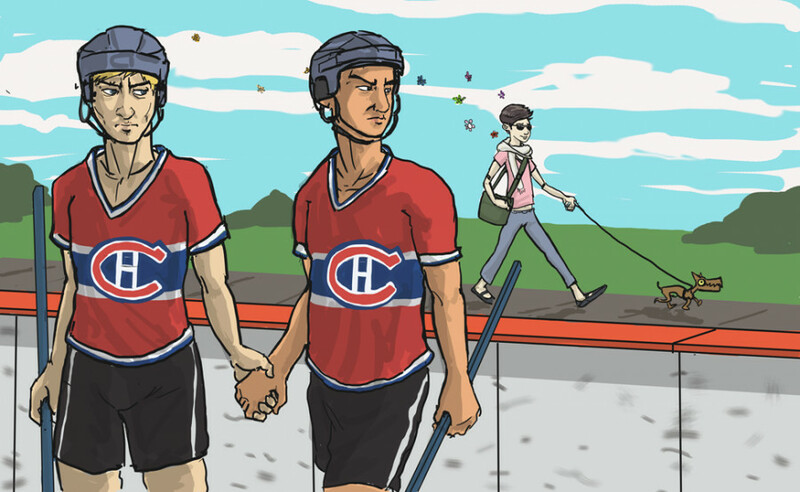 A 2006 poll published in Sports Illustrated found that 80 per cent of NHL players would back an openly gay teammate. And the support doesn’t stop there. In 2010, the Stanley Cup made its first appearance in a Gay Pride Parade when, following the Chicago Blackhawks’ Cup win, defenseman Brent Sopel marched through the streets of Chicago with the silver prize in memory of Brendan Burke. Following the 2010–11 NHL season, the New York Rangers’ Sean Avery recorded a video endorsing the marriage equality campaign in New York state. As of 2012, five of the biggest professional sports leagues in North America—the NHL, the National Basketball Association, the National Football League, Major League Baseball and Major League Soccer—have policies to protect gay employees. And more and more, high-profile athletes, such as NBA legends Charles Barkley and Grant Hill, are speaking out compassionately on behalf of gay athletes. In Anderson’s earlier-cited book, a closeted NHL player discusses being gay in professional hockey. While he admits to some difficulties, he notes a marked difference in opinion on homosexuality between the world of minor hockey and that of the NHL. The reasons behind this apparent change remain elusive, but Corey’s focus on the attitudes of his neighbours suggests one possibility. In minor hockey, there is but a small divide between the fans and those involved in the game itself. Stand-dwellers, for the most part, include parents, friends, acquaintances and the occasional hockey scout. As such, community ideologies infiltrate the locker room freely and influence a team’s unwritten codes of behaviour. In the NHL, however, there is a distinct barrier between the game’s participants and its supporters. The league sets a high standard of professionalism and punishes those who fail to abide by the rules—rules that are much less tied to the moral values of spectators. It is also possible, of course, that shedding some of that boyhood immaturity—and travelling extensively, primarily to big, diverse cities—affects players’ opinions on the matter. Whatever the reason, the fact remains that professional hockey offers some much-needed hope for Corey, who longs to play the game without fear of being ostracized by his teammates. But what about future generations of players? How can the situation at the lower levels be improved for them? According to Burke, the participation of career sportsmen is crucial to bettering the lives of those who are suffering. It seems odd, however, to suggest that fixing the problem should involve one of the things from which it stems: an emphasis on masculinity. But perhaps Burke has a point. A word like “gay” refers to much more than a sexual preference: it embodies an entire culture. And for many, that culture is so far removed from daily life that it arises only in the occasional news story or television show. Their conception of “gay” is thus influenced entirely by various forms of media, very few of which showcase the average “bro” who simply happens to prefer the company of men. As it stands, an openly gay, elite athlete is an oxymoron in professional sports today. But the eventual emergence of such players will force the hockey world to look at homosexuality under a new light—one that will shine on people like Corey, who still suffer silently in the darkness of attitudes even older, and even colder, than the arenas in which they play.